Looking for an easier way to copy content from a computer on to your iOS devices? Your wait ends here. WALTR 2 is the new and improved version of the original WALTR app that makes transferring content from Mac or Windows to iOS devices so much better. With features like Universal Connection Bridge, Automatic Content Recognition, Smart Adaptive Conversion and Automatic WiFi, WALTR 2 ensures that all your transferred content stay organized and playable, no matter what format they originally were. Transferring content from your computer to your iPhone, iPad or iPod Touch with the help of WALTR 2 is easy. Just open WALTR 2 on Mac or Windows, drag a desired content on to the application window, and you’re done. You don’t even have to plug your iOS device to your computer, as long as they are connected to the same WiFi network. All the transferred content automatically lands within their respective default native iOS apps – Music for music files (MP3); Videos for video files, movies and TV shows; iBooks for ebooks. Even ringtones (AMR files) can be copied directly into the Ringtone Settings. Sounds like magic? That’s because a lot of technology is involved under the hood. You can learn more about WALTR 2 in our dedicated article. WALTR 2 is available for Mac and Windows as a free trial and at a regular price of $39.95. You can also avail the WALTR 2 Double Pack at a discounted price of $59.95, or a Family Pack of up to 5 licenses for a discounted price of $89.95. 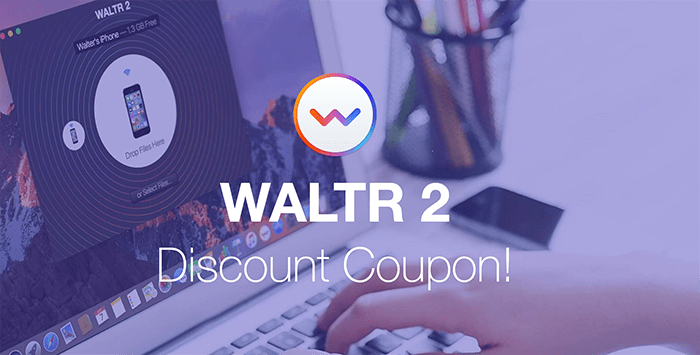 As 7labs readers, you can get a flat 10% discount on WALTR 2 Single License, and up to 59% discount on WALTR 2 Double and Family Packs by applying the following WALTR 2 Discount Code.